We were a group of 65 ranging in ages form 10 months to mid 70&apos;s. Most of us from New York, a few from Pittsburgh. Had some first time cruisers with us, this was my 30th! Most of us flew in on British Airways from JFK (but it was really American Airlines) non-stop and got a rate of $501. We spent two nights pre-cruise at the Hotel Continental Barcelona. We had several families of 3 and 4 and needed a hotel that could accommodate. Used Europe Connect for all of our transfers within Barcelona. Due to the anniversary of the terrorist attack and the protests going on, we were dumped off about 5 bocks form the hotel and had to walk with all out luggage. Driver had no choice, police had streets closed. One tiny elevator that held about 4 people and 2 pieces of luggage at a time was not great for over 50 people checking in at one time. LOL. Hotel rooms were spacious (even for my family of 4) and showers were awesome. The 24 hour snack buffet, and included beer, wine, soda and juice was a great perk. Lovely little courtyard and the balconies were great. Ours overlooking La Rambla. You need to be buzzed in on your floor and turn in your key to the desk when you go out. There are other hotels and a hostel within the building. Amazing location on La Rambla!!! Right in the middle of everything. Spent two nights. 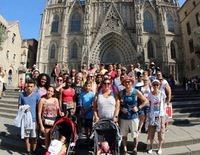 We arranged a full day private tour through Spain Private Tour Guides on 08/18. Went to Park Guell, La SaGrada Familia, took a panoramic bus tour and then ended with a walking tour. It was amazing and our tour guide Fernando was awesome! 08/19 Off to the EPIC, embarkation a breeze. Have sailed the EPIC before, the rooms are kind of quirky. Not a fan of the curved walls or the bathroom set-up but certainly not a deal breaker. Storage was an issue, but there were 4 of us in the room and we packed for 11 days away. Day 1: Boarded the ship by about 11:30, rooms were not ready until about 1:40. Had lunch at the buffet and enjoyed the sun and the pool. Dinner at Taste was great. Day 2: Sea Day. Went to the Cruise Critic Meet and enjoyed the sun. Last relaxing day, as we had each and every moment planned for each port. Dinner at Moderno was lovely! Day 3: Rome. We had a packed day planned. Private tour with skip the line access to The Colosseum, and the Vatican Museums, Sistine Chapel, St. Peter&apos;s Basilica, Trevi Fountain, Spanish Steps. Brief stop for pizza and gelato in between. Dinner was at Shanghai. we really enjoyed it!! Day 4: Pompei, Vesuvio, Herculaneum. Another jammed packed day! First stop on our private tour was Pompei. It was brutally hot but amazing. A welcome break was had next at the Cantina del Vesuvio, a lovely wine farm on the slopes of Mount Vesuvius. We had a tour of the winery, sampled grapes, and had an amazing lunch and wine tasting. The staff was friendly and informative! So glad we planned this. Then it was off to Herculaneum for more exploring. It was scorching and the rain showers were welcomed! This was the day of my son&apos;s 11th birthday, and 50 of us dined at Teppanyaki to celebrate. Service was fantastic as was the food! Day 5: Naples: Florence/Pisa. Once again we had a private tour and walked our feet off exploring Florence including the Duomo, Piazza delle Signoria, Medici chapesl, Ponte Vecchio, Baptistry & Bell Tower and the Academia to see Michaelangelo&apos;s David. Very brief stop for something to eat and then off to Pisa to Piazza dei Miracoli, to see the Leaning Tower, Pisa Cathedral and Baptistry. Dinner was at Cagney&apos;s and was fantastic as usual. Day 6: Cannes-Monte Carlo & Monaco. Had a little issue with our private guide here. We were split into two groups as there were 63 of us. The smaller group got to see Monte Carlo, Monaco, the Medieval Village of Eze and a flower market. The larger group only got to see Monaca and Montel Carlo, both beautiful, but disappointing that we did not see all we had planned to. Dinner was at LeBistro and we thoroughly enjoyed it! Day 7: Palma Majorca: Private tour of the Caves of Drach followed by a stop at Porto Cristo fishing village and beach with time for swimming, shopping, a bite to eat. An amazing day! We had dinner at O&apos;Sheehan&apos;s. The food was good but everything came at once, appetizers and entrees. Day 8: Debarkation. The elevators were impossible, even at the late 9 AM time. We walked down from 14. Picked up by our bus and dropped at our post cruise hotel for one night. Post Cruise: One night at the Catalonia Diagonal Centro Hotel. Beautiful hotel with huge rooms and a tiny pool on the second floor. 08/27/18 Time to go home. As we had a 10 AM flight and needed to leave the hotel at 7, we would miss breakfast. The concierge asked how many children were in our group and packed a lovely picnic box for each of them so that they would not be hungry and have to wait to eat at the airport, a wonderful touch! Our transfer bus dropped us off at the right terminal, but the farthest distance from our airline. LOL There is a lot of walking within the airport and we were glad we chose the early pick up time! Kids: My boys are 11 and 13. This trip they did not go to the club at all. Their friends that did, enjoyed their time there. The younger one spent a lot of time at the basketball court. They enjoyed the water slides, ping pong, etc. Entertainment: We were booked for Priscilla Queen of the Damned for Friday night but that show was cancelled. We were rescheduled for Thursday night but it interfered with dinner so we did not get to go. We were so exhausted after all of our excursions, we did not get to any other shows. Our friends loved Burn the Floor and Dueling Pianos. Spent some time at the Martini Bar and enjoyed it. We had experienced Cirque and the Ice Bar on several other occasions so we did not indulge this trip but those that did had a ball. Service: Our cabin attendant Chris was great as was all of the staff we encountered. Excellent service throughout the ship. Summary: My gang of 65 had a great cruise on the Epic. The design is not my favorite of the NCL ships but if the itinerary and price were right, would sail her a third time. The itinerary is awesome, and food and service on the ship was great. I am not great at uploading pictures so I apologize for the lack of in this review. Will be happy to answer any questions if I can! See you again soon NCL! We were a group of 65 ranging in ages form 10 months to mid 70&apos;s. Most of us from New York, a few from Pittsburgh. Had some first time cruisers with us, this was my 30th! Most of us flew in on British Airways from JFK (but it was really American Airlines) non-stop and got a rate of $501. We spent two nights pre-cruise at the Hotel Continental Barcelona. We had several families of 3 and 4 and needed a hotel that could accommodate. Used Europe Connect for all of our transfers within Barcelona. Due to the anniversary of the terrorist attack and the protests going on, we were dumped off about 5 bocks form the hotel and had to walk with all out luggage. Driver had no choice, police had streets closed. One tiny elevator that held about 4 people and 2 pieces of luggage at a time was not great for over 50 people checking in at one time. LOL. Hotel rooms were spacious (even for my family of 4) and showers were awesome. The 24 hour snack buffet, and included beer, wine, soda and juice was a great perk. Lovely little courtyard and the balconies were great. Ours overlooking La Rambla. You need to be buzzed in on your floor and turn in your key to the desk when you go out. There are other hotels and a hostel within the building. Amazing location on La Rambla!!! Right in the middle of everything. Spent two nights. We arranged a full day private tour through Spain Private Tour Guides on 08/18. Went to Park Guell, La SaGrada Familia, took a panoramic bus tour and then ended with a walking tour. It was amazing and our tour guide Fernando was awesome! 08/19 Off to the EPIC, embarkation a breeze. Have sailed the EPIC before, the rooms are kind of quirky. Not a fan of the curved walls or the bathroom set-up but certainly not a deal breaker. Storage was an issue, but there were 4 of us in the room and we packed for 11 days away. Day 1: Boarded the ship by about 11:30, rooms were not ready until about 1:40. Had lunch at the buffet and enjoyed the sun and the pool. Dinner at Taste was great. Day 2: Sea Day. Went to the Cruise Critic Meet and enjoyed the sun. Last relaxing day, as we had each and every moment planned for each port. Dinner at Moderno was lovely! Day 3: Rome. We had a packed day planned. Private tour with skip the line access to The Colosseum, and the Vatican Museums, Sistine Chapel, St. Peter&apos;s Basilica, Trevi Fountain, Spanish Steps. Brief stop for pizza and gelato in between. Dinner was at Shanghai. we really enjoyed it!! Day 4: Pompei, Vesuvio, Herculaneum. Another jammed packed day! First stop on our private tour was Pompei. It was brutally hot but amazing. A welcome break was had next at the Cantina del Vesuvio, a lovely wine farm on the slopes of Mount Vesuvius. We had a tour of the winery, sampled grapes, and had an amazing lunch and wine tasting. The staff was friendly and informative! So glad we planned this. Then it was off to Herculaneum for more exploring. It was scorching and the rain showers were welcomed! This was the day of my son&apos;s 11th birthday, and 50 of us dined at Teppanyaki to celebrate. Service was fantastic as was the food! Day 5: Naples: Florence/Pisa. Once again we had a private tour and walked our feet off exploring Florence including the Duomo, Piazza delle Signoria, Medici chapesl, Ponte Vecchio, Baptistry & Bell Tower and the Academia to see Michaelangelo&apos;s David. Very brief stop for something to eat and then off to Pisa to Piazza dei Miracoli, to see the Leaning Tower, Pisa Cathedral and Baptistry. Dinner was at Cagney&apos;s and was fantastic as usual. Day 6: Cannes-Monte Carlo & Monaco. Had a little issue with our private guide here. We were split into two groups as there were 63 of us. The smaller group got to see Monte Carlo, Monaco, the Medieval Village of Eze and a flower market. The larger group only got to see Monaca and Montel Carlo, both beautiful, but disappointing that we did not see all we had planned to. Dinner was at LeBistro and we thoroughly enjoyed it! Day 7: Palma Majorca: Private tour of the Caves of Drach followed by a stop at Porto Cristo fishing village and beach with time for swimming, shopping, a bite to eat. An amazing day! We had dinner at O&apos;Sheehan&apos;s. The food was good but everything came at once, appetizers and entrees. Day 8: Debarkation. The elevators were impossible, even at the late 9 AM time. We walked down from 14. Picked up by our bus and dropped at our post cruise hotel for one night. Post Cruise: One night at the Catalonia Diagonal Centro Hotel. Beautiful hotel with huge rooms and a tiny pool on the second floor. 08/27/18 Time to go home. As we had a 10 AM flight and needed to leave the hotel at 7, we would miss breakfast. The concierge asked how many children were in our group and packed a lovely picnic box for each of them so that they would not be hungry and have to wait to eat at the airport, a wonderful touch! Our transfer bus dropped us off at the right terminal, but the farthest distance from our airline. LOL There is a lot of walking within the airport and we were glad we chose the early pick up time! Kids: My boys are 11 and 13. This trip they did not go to the club at all. Their friends that did, enjoyed their time there. The younger one spent a lot of time at the basketball court. They enjoyed the water slides, ping pong, etc. Entertainment: We were booked for Priscilla Queen of the Damned for Friday night but that show was cancelled. We were rescheduled for Thursday night but it interfered with dinner so we did not get to go. We were so exhausted after all of our excursions, we did not get to any other shows. Our friends loved Burn the Floor and Dueling Pianos. Spent some time at the Martini Bar and enjoyed it. We had experienced Cirque and the Ice Bar on several other occasions so we did not indulge this trip but those that did had a ball. Service: Our cabin attendant Chris was great as was all of the staff we encountered. Excellent service throughout the ship. Summary: My gang of 65 had a great cruise on the Epic. The design is not my favorite of the NCL ships but if the itinerary and price were right, would sail her a third time. The itinerary is awesome, and food and service on the ship was great. I am not great at uploading pictures so I apologize for the lack of in this review. Will be happy to answer any questions if I can! See you again soon NCL! Great larger covered angled balcony! A little tricky to maneuver through the hallways from the elevators, got lost a few times. LOL Not a fan of the bathroom set-up (but have cruised the EPIC before and it did not stop us from booking) and could use a little more storage space. Other than that it was pretty darned good! Awesome tour of city as well as Park Guell and La Sagrada Familia! We had to split into 2 groups as we were 63 people. Our tour was to include Eze, Monaca & Monte Carlo. One of our vehicles did all of those as well as an extra stop at a market. The other, only Monaca & Monte Carlo. Would have been an excellent rating except for that. Very disappointed that we did not get to go to Eze. Wonderful experience. Skip the line access to Pompei, followed by a wonderful lunch and wine tasting at Cantina del Vesuvia, a wine farm on the slopes of Mt. Vesuvius, then finally Herculaneum. Great day! First the Caves of Drach, beautiful and lovely concert in the lake. Then of to Porto Cristo for beach, shopping, bite to eat! Skip the line access to the Colosseum, dropped off free time in St Peter&apos;s Square, Trevi Fountain, Spanish Steps, Pizza & Gelato, Vatican Museums, St. Peter&apos;s Basilica, Sistine Chapel.